Popular software programs contain millions of line of code. Bad guys exploit flaws (vulnerabilities) in the code to deliver malware. Except when they can’t. 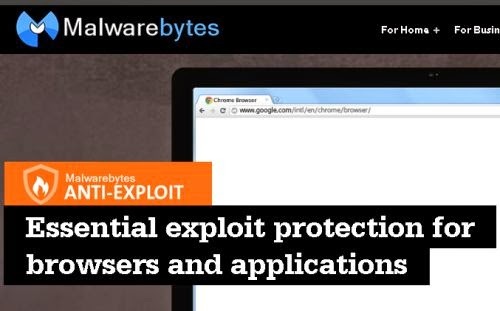 Malwarebytes Anti-Exploit wraps three layers of security around popular browsers and applications, preventing exploits from compromising vulnerable code. Not an antivirus, but compatible with most antivirus, Malwarebytes Anti-Exploit is a small, specialized shield designed to protect you against one of the most dangerous forms of malware attacks. And it’s free. Click the link below to download & try it.